I can’t believe the high I have experienced during and since the swim. Something happened that day and I am truly grateful that it worked out the way it did. I remember sitting on the beach in Dover the day after the swim and having to tell myself that I had done it! The English Channel is such a mental battle and when they say 90% mental and 10% physical they are not far off the mark. The shortest distance from Dover to Calais is 21 miles, but in my case and ninety percent of other swims you end up swimming further. According to Andy’s G.P.S – I swam 28 miles. I will never forget when I first realized that I might be able to finish the crossing. I had been swimming for about 5.5 hours and my fingers started to straighten out. I can always tell if the water temperature is 15’C and below, because I develop what I call “claw hand”. Simply, it’s my reaction to the cold. It was about 10:30am and the air temperature was starting to rise and even though there was cloud cover I could sense the sun. I remember looking at my hand as it entered the water, with no “claw” and thought to myself “unbelievable…this just might happen today”! The water temperature had risen to 16’C. 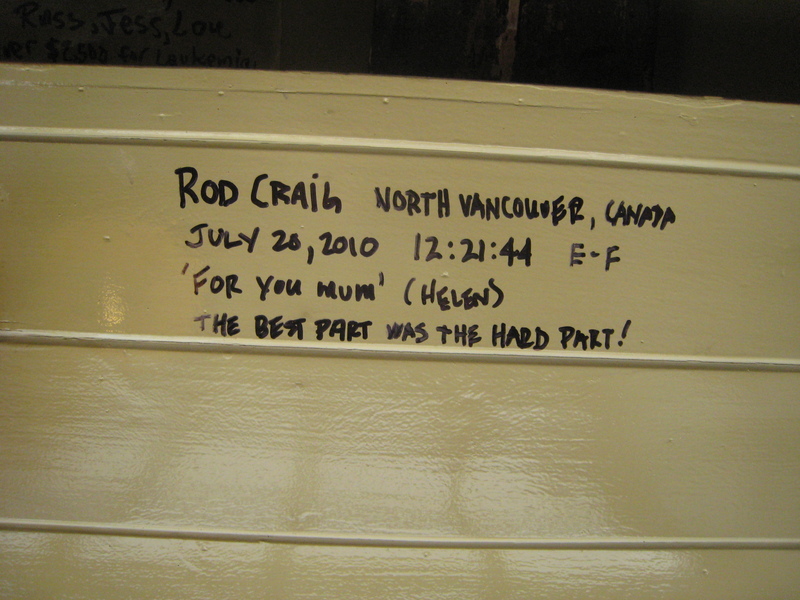 This made me tear-up a bit because at the start of the swim, I asked my mum to keep me warm. She kept her promise. I will never forget this turning point as the hours leading up were filled with doom and gloom. The demons hiding in that dark, cold hallway were filling my head with thoughts of “aborting the swim with some sort of dignity”. So when I realized for the first time that I was getting used to the cold, I was overcome with emotion. I was now on a mission to make up lost time and get myself to France. I stopped feeding on Carbo-Pro because it was causing stomach cramps and coming right back up. I was now eating solid foods and feeling energized. 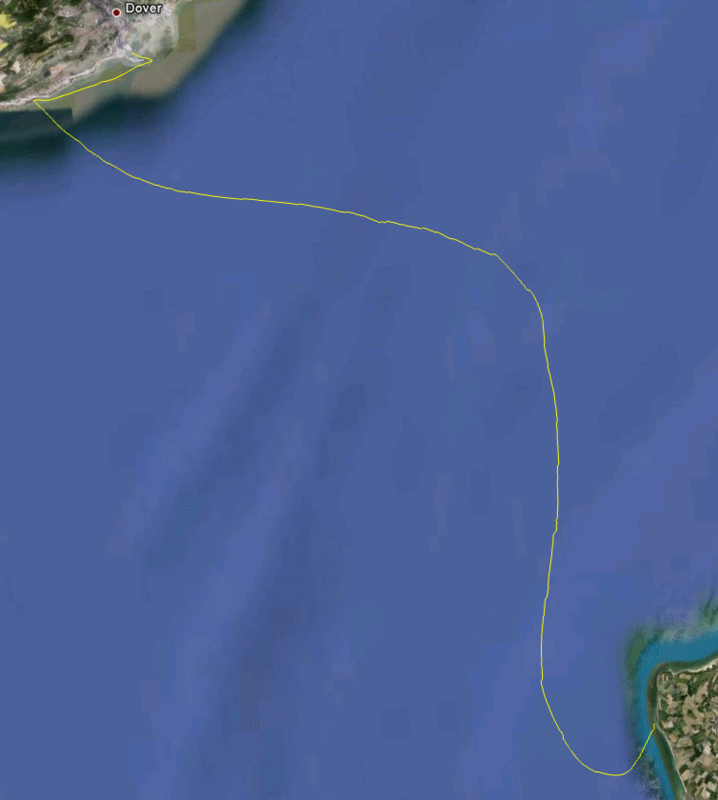 At 7 hours we crossed the French shipping lane and I was feeling good. I don’t recall the next 4 hours other than looking over at the Louise Jane and all my friends on board. I could see Bonnie with a worried, concerned look, as she knew how much this meant to me. The rest of the crew would take their turns to rest their arms on the railing and watch me swim for a few minutes. I didn’t want to let them down and this made me even more focused and determined. At hour 8-9 I felt strong and was still concerned with making up lost time. I had originally thought my feeding times would be approx 30 seconds and when I look back I was taking, sometimes two minutes and when the tide and current are pulling you back this can amount to much lost time. I could feel the current tugging harder as we approached France and remember thinking that if it got any stronger I was in for a battle. At one feed stop, I asked Andy if we were sighting on a beach way in the distance and his reply to me was “just follow the boat”! I loved his reply because he was the boss, and I had all the confidence in the world that he was taking the best line. I had heard stories of swimmers getting frustrated and slapping the water because they could clearly see the French coast and wondered why they couldn’t just bee line it. I kept my head down and was actually surprised when Andy told me that I had one mile to go and now was the time to head straight in. I thought…one mile…I can finish this thing off in about 25 minutes! As I approached the shore I noticed how big the boulders were, but was not overly concerned about clearing the water line. I waited for a wave to pick me up and place me on one of the flatter rocks. I took two steps and fell forward only to catch myself. I laughed because I should have known better that my land legs would be gone after 12 hours! I turned around and could hear the Louise Jane blow her horn. I was not worried about the time on shore; I just raised my arms and gave a thumbs-up to the boat. Andy (first mate) kept me focused on getting on board the tender. 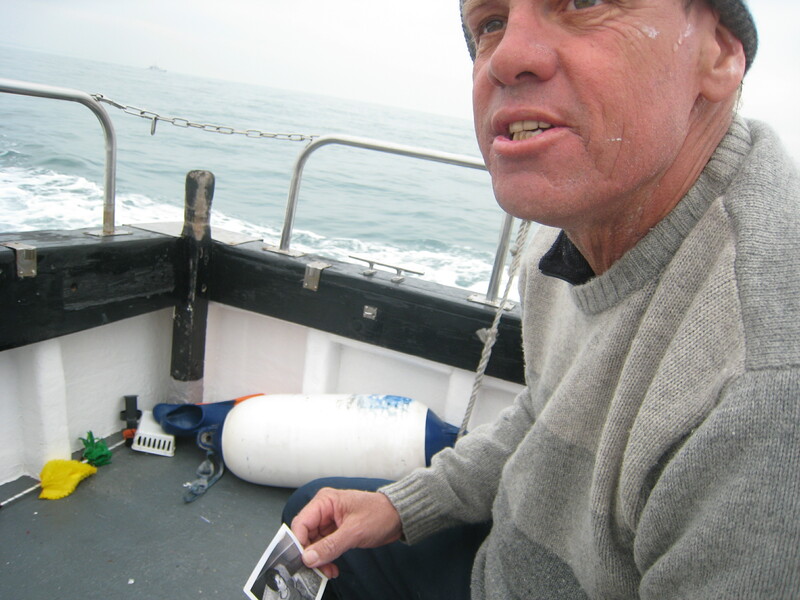 I was absolutely covered in Lanolin and immediately coated the interior of the tender as I crawled on board. Stepping onto the Louise Jane was a welcome relief and all the well wishes much appreciated. I recall the boat ride back as being somewhat surreal. Everybody had quickly dressed me in warm clothes, but I was not all that cold. We were moving at a slight pace as we had many passengers and because of this I don’t think Andy could have gone much faster. As we left the French shore we passed by another boat with a swimmer approaching. He was about 400meters from shore. I later found out that he was an American that went on to complete the swim in approximately the same time that I did. 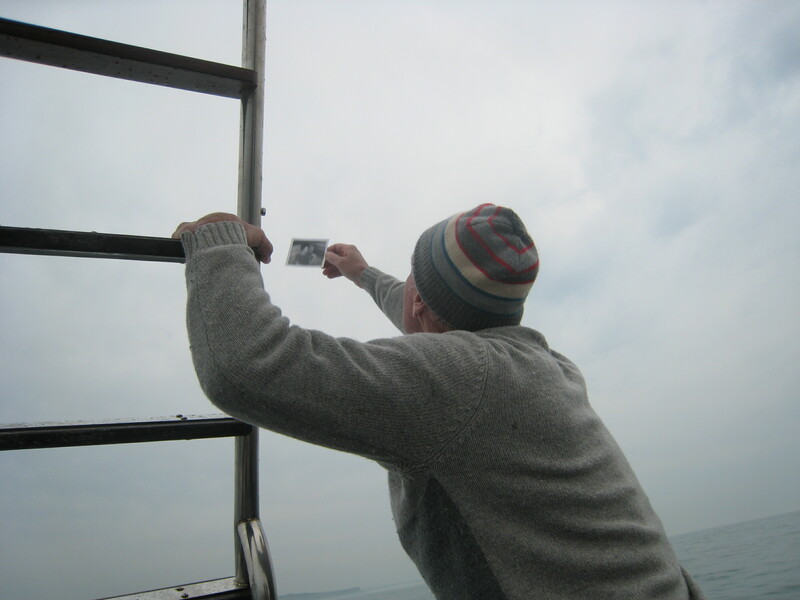 I had dedicated this swim to my mum who passed away four years ago and when we were about five kilometers from France I stood up at the stern of the Louise Jane and cast a photo of her into the Channel. She kept me warm in the waters so cold. I will never forget that moment. I know that she worried every time I would swim, but deep down I know she understands. We arrived back in Dover about 8:00pm and it didn’t take long to unload all the gear and thank everybody involved. I know that all of us just wanted to rest and resume things the next day. I slept ok that night as I was still replaying the swim in my mind. 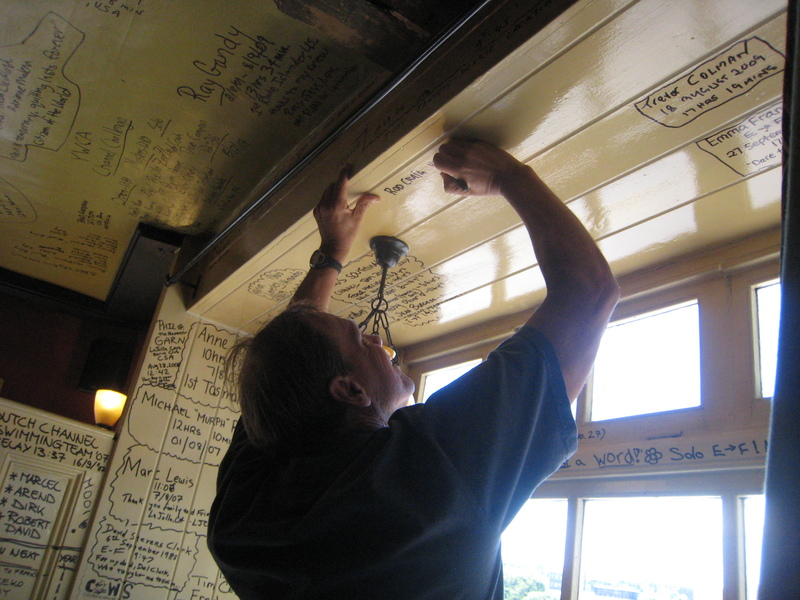 We met with John and Hugh and decided to walk over to the White Horse Pub and see if I could sign the ceiling as a large number of successful channel swimmers had ritualistically done before me. I wasn’t 100% on what to write, but I managed to scribble my best. It was a bit of a laugh because as I was writing I had to stop every 20 seconds to rest my arms…wonder why? Our vacation was quickly coming to an end. We decided to take the ferry to Calais (not swim), rent a car, spend a few days on the French coast and then drive to Bruges, Belgium for two more days and then back to London for one more day before we before we caught our flight home. British Airways upgraded us to first class, which was amazing. They had no idea I swam the Channel it was purely a fluke! (the flight)…I mean. My Fiancée Bonnie for believing in me. My dad for all his support and helping the cause anyway he could. Also for the many cold water swims at Ambleside beach. It takes a lot of energy to motivate yourself to train in cold water, but with someone by your side it makes things that much easier. Brent Hobbs for blazing a trail for me and others others to follow. I can’t tell you how instrumental he was in preparation for the Channel. “Team Midlife” for all their support before, during and after the swim. Team Aquatics for their recognition, sponsorship and interest in marathon swimming. Bill Weymark for his more than generous sponsorship. Cruisers Aquatic Club for their generous sponsorship. Rick Gustavson for his genuine interest and for hosting an amazing pre Georgia Strait and English Channel get together at his home that included many swimming friends. Martin McLaren for hosting a wonderful brunch post training swim at Bachelor Bay, which included a majority of open water friends including: Rod, Robin, Ursula, Patty, Mick, Beverly and many more. The list goes on and on…I just hope I can show my appreciation in someway as we cross paths in this wonderful swimming community here on the West Coast. Thanks for sharing the experience of a lifetime. Your mum is smiling. Really enjoyed your “RECAP”– thanks for forwarding it to me. Was quite touched by your tribute to your Mom –I miss her a lot too. Keep in touch.